Walsine Pierce: COOKING TODAY: Life is so easy, and good!! Included on my business card, along with address, phone number and Email address, are my self proclaimed areas of expertise. Just to be right up front, I know that "an expert" is "a little drip of the past". Now that that is out of the way, I claim to be a Cook, Gardner, Fisherman, Sailor, Canoeist, Backpacker, Poems, Stories, Folk Music & s/v Christy Anne. Wow! Such a talented guy, huh? Like I said, a little drip of the past. On my last wilderness canoe trip I mentioned to my son Todd that my friend Don Wilson was the best fisherman I knew. Todd immediately replied "Well, Dad, you are the best fisherman I know". Todd is no slouch at catching fish so I still get a warm glow from recalling his comment. An area where I can do well is cooking. I take great pride at being a camp cook. I love to make "Ohio River Stew". The special flavor that my fellow fishemen claim to enjoy is all the fresh hatch of may flies that get into the stew as I stir it. Thats my story and I'm sticking to it. I enjoy watching hungry people eat food that I have prepared over a wood fire in the wilderness. Under the most crude conditions I can turn out pretty tasty fare. Stew, biscuits, pie iron pastry and "boiled" coffee. Yum Yum. Different people have their own favorites. Most everyone likes my pies. I don't know that they taste any better but I have learned to bake an extremely flaky crust with my own signature fluting. My pies are always the first to sell at bake sales. I usually bake a cherry pie for my son Mark's birthday. One year I got confused, Uh, I get confused more than just "one year". Anyhoo, I got confused and took Mark his birthday pie in April. His birthday is May 19th. No, he didn't complain. Julie has asked me to make a lot of pies for the upcoming church bake sale of which she is in charge. I promised her 16 pies. Last year I baked an even dozen. For Julie's 40th birthday I baked 21 pies for a pie fest. I usually bake a lot at thanksgiving but 21 is my record. My granddaughter, Jillian Elizabeth Pierce, likes my Corn Chowder. Her sister, Jennifer, likes my sausage gravy and biscuits. I bake a passable buttermilk biscuit and make fair-to-middling browned flour sausage gravy. I called Julie this morning to a different sausage gravy and biscuits. 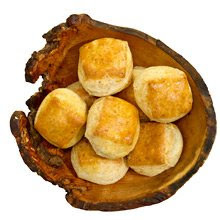 My friend and great cook, Carla Ludwig, introduced me to the bulk packed, frozen Pillsbury biscuits. I cannot bake a better biscuit. They come 36 to a pack and that can be a problem. Before you can use them up they just blend together and become a frozen "glob". Many people call Julie "Jewell". She is that! She repacks my frozen biscuits two to a package in individual packs. Pop four on the baking stone and in about 25 minutes at 375 you have a beautiful and delicious biscuit. Try them and you will stop using the small packs of frozen biscuits and save a lot of money. Some where back in time we purchased a bulk of quick sausage gravy mixes from Sam's. It is not as good as the gravy Jenny likes. But it is so much easier than frying sausage and browning flour and far cheaper considering that I use two cans of condensed milk which has become expensive. I used this for a breakfast at the church recently and everyone thought it was good. Sam no longer carries the dry mix. 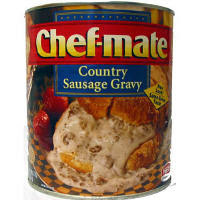 Now they have sausage gravy in a large can. Julie's daughter Jackie said it is very good. I bought a can to try it out. That is what I fixed for the first time this morning. Frequently, when time is of the essence, I'll drive around the lake to McDonalds and buy their sausage gravy and biscuits as the coffee perks. It is hard to believe that two orders of sausage gravy and biscuits and two hash browns now cost over $8.00. I don't know if I'll ever make browned flour sausage gravy again. The sausage gravy out of the can was that good. I like the flavor of Marjoram and may add a bit of that along with additonal pepper in my next fixings. Otherwise, we have at least a dozen and a half larger breakfasts for less than a dollar a serving. So long, McDonalds, it's been good to know you! Having lived a portion of my life without any modern appliances at all, no electricty or in door plumbing until I was a teenager, I love the ease of modern day cooking. Having said that, I consider it vital to know how to cook from scratch. An important part of being prepared. Praise the Lord and pass the biscuits. Uh, pass the blackberry jelly! "As a child my family's menu had two choices: Take it or Leave it!" Bye-the-bye, again! Two days in a row I got a comment while I was still writing the blog. Thanks, Mark. One cherry pie coming up!